It had been a long day working around the house with our cooking buddies. Unfortunately while the mind is willing the body is aging and certainly not as agile as just a few years ago. After a few glasses of Pinot Grigio, some salami and cheese, the question of dinner came to mind. We were tired, no one really wanted to cook but after a day in the sun we needed something flavorful and filling. Timidly, I suggested a stalwart of every Italian family’s dinner repertoire. 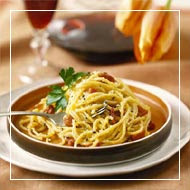 The Carbonara is one of the most well known dishes in Italy. 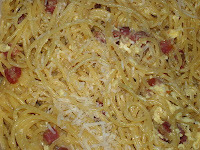 From Cuneo to Pantelleria just about everyone will make some version of a Carbonara. As with most antique dishes there are several stories passed down over the generations about the origins. The first talks about the Carbonari, a group of French monks. The Carbonari were considered a heretic secret society much like the Masons and were hunted and killed by the Catholic Church. Another gives the paternity to Ippolito Cavalcanti, a chef from Naples. Ippolito Cavalcanti published his version in his cookbook. The most reliable seems tells of the society of coal producers and salesmen in Naples who would break the big pieces of coal into smaller pieces which were then sold on the streets of Naples to local families. The dish is popular because it is quick, nutritious, savory and made with ingredients readily available around the year. This is not the original Italian recipe. We have changed the recipe for the US due to the extensive health problems, Salmonella and other bacterial viruses found in mega structures, of US industrial egg production facilities. In Italy the dish would not have heavy cream and the raw egg mixture would be added directly to the drained pasta. Some recipes will also use Pecorino instead of Parmesan cheese. I have also seen a few family recipes add flaked peperoncino when the dish is served. Cut the bacon into small pieces, about ½ inch wide. Select a large heavy skillet. Over medium heat melt the 2 tbsp of butter with about 10 turns of cracked pepper. Once the butter is melted and beginning to clarify, add the bacon. Cook for about 5 minutes. Do not burn. Remove the cooked bacon and pour the butter grease fat. Turn off the heat and set the skillet aside. Do not clean the skillet. Boil the spaghetti or other pasta in abundant salted water. While the pasta is cooking, mix together, in a medium sized bowl, the eggs, Parmesan cheese, cream and a couple of turns of pepper. Whisk together until the mixture is smooth. 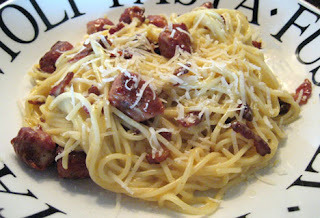 Three minutes before the pasta is ready, melt the remaining butter over low heat with about 10 turns of ground pepper. Add the egg mixture to the skillet, stirring constantly. The objective is to raise the temperature of the eggs without scrambling them. When the pasta is ready, drain completely. Pour the pasta directly into the skillet. Add the bacon. Stir everything together quickly and serve. Serve immediately in individual pasta dishes. Grind fresh black pepper on every plate. Add additional grated Parmesan cheese as desired. now david, there is no excuse to use heavy cream when technology has given us pasteurized eggs. Tracie b. I believe the problem is more that we have allowed industrial processes to take over too much of our food source. There is something about eggs in a milk carton that just does not sit right with me. The thoughts of tainted gluton, spinach alla salmonella, lettuce that can kill you, meat from animals that can no longer stand up et al keeps coming to mind. "Who knows where those eggs have been in the process..."
the eggs that i'm talking about come in an EGG carton, in nice white shells. they're real eggs! BUT, i know what you mean. my suocera will slap around a raw chicken leg and rinse her fingers briefly with a little tap water just before wiping them on a clean dish towel. it freaks me out, but i have to remind myself that the need to worry just isn't as great. 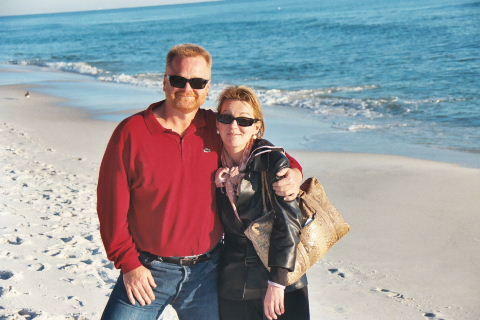 Tracie b. Again I do not trust industry. They have one concern, making as high a margin as possible cutting as many corners as possible. What do we know that during the process the eggs are not contanimated with something else? I hope that over the years we will reevaluate our priorities and begin thinking about the quality of life instead of what trinkets we can show to our neighbors. History tells us that if we lose focus on the people the regime will fall. Most likely I will not see the change in my lifetime, perhaps you will be fortunate enough to see the day when people actually count more than corporate profits. That looks awesome. SO awesome, I think I will have spaghetti tonight ... even if there is no prayer of it being that awesome. Jennifer Perhaps you could try the Matriciana, our friends thought this was one of the best dishes they have ever had and it is very simple. Reading this just makes my mouth water. Delicious. But, what about the wine to go with the pasta? Lexcen Great point! Falanghina, Greco di Tufo, Aglianico and just about any good table wine both red and white. you need to get out a little more than going to your mail slot. Jeesh... U R so "old hat", so "fare aria"
Beatrice Touched a soft spot in the patriotic heart, did I? Flavors from Afar does not sell eggs and would not be appropriate to travel 20 miles to buy eggs. Ditto for the Farmers Market. I should increase the US dependency on Oil from bad places to buy eggs that have not been produced in some industrial complex where public health concerns are less important than an extra 1% of gross margin? May I suggest, with an equal amount of humility, that it may be valuable to stop trancing around dallas in our automobiles and begin thinking about what really matters. Good wine, Good Food, and Good Friends. All else is merely a way to fill that small window of time we are on the earth.